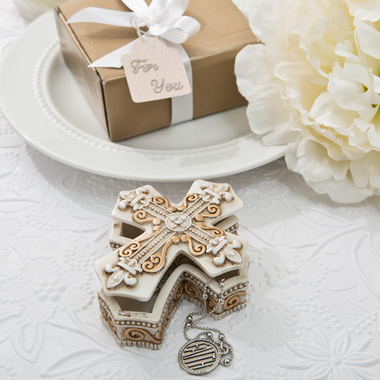 Delight the guests at your blessed celebration with ornate cross jewelry boxes featuring fantastic handcrafted filigree details. Each of these exquisite party favors comes with an elegant antique finish and lovely matte gold designs. The faith-based favor will be fondly cherished by your dear ones and always remind them of your religious celebration. The vintage style trinket boxes are 3 1/4" x 2" in size, and are crafted from poly resin and hand painted in an antique ivory finish. There is a single clear rhinestone accent in the center. With a lid that lifts off easily, your guests can use them to conveniently store jewelry or small change. The gifts arrive packaged in a gold box with a white satin ribbon and "For You? 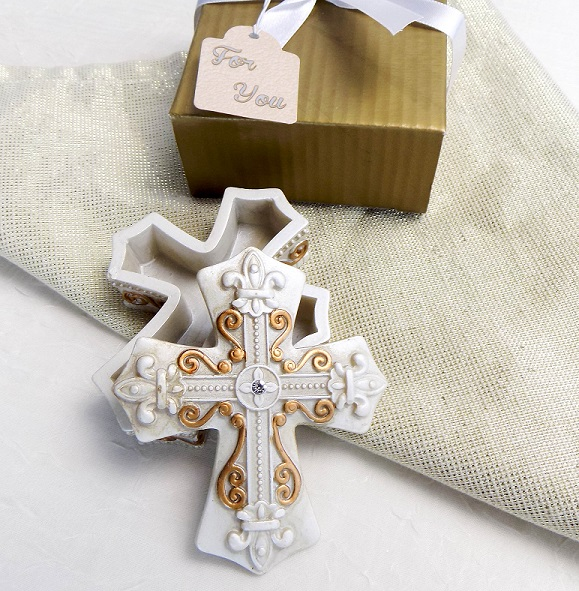 tag" They make stunning party favors for christenings, communions and other Christian religious events.